Anyone who’s been reading this blog for more than a few months knows I’m bullish on mobile social networking. The space is wide open at this point – no one has created an application that has gotten enough traction to go mainstream. That’s partly because of tech limitations – browser based networks don’t leverage the power of the mobile device, and client based applications are blocked by service providers and handset limitations. But it’s coming. A few years from now we’ll use our mobile devices to help us remember details of people we know, but not well. And it will help us meet new people for dating, business and friendship. Imagine walking into a meeting, classroom, party, bar, subway station, airplane, etc. and seeing profile information about other people in the area, depending on privacy settings. Picture, name, dating status, resume information, etc. The information that is available would be relevant to the setting – quick LinkedIn-type information for a business meeting v. Facebook dating status for a bar. That requires a social network that has presence, location and contextual information about you. It needs to know where you are (via GPS or triangulation), if you are in business or personal mode, and similar information for the people around you. It also needs, at a basic level, the ability to sort and browse the people around you based on their picture and name, and what they are looking for (dating, investments, job, friendship). Once this network is established, you’ll know everyone’s name who’s around you (if they choose to share it), and enough basic information to jog your memory if you know them, or meet them if there’s mutual interest. Poking someone on Facebook is great, but “poking” them when you’re in the same bar as them can result in much more immediate social gratification. The mobile social network that wins will go way beyond, say, Facebook’s iPhone site, which doesn’t leverage location information, or help you meet people around you. So when mobile social network startups reach out to us, we give them a lot of attention. I waded through a bunch of them in September 2007, and followed up with a look at LimeJuice in December. Frankly, MySpace and Facebook could lock up this space simply by focusing on it, but as far as I can tell from discussions with execs at both companies, they’re more focused on each other than in dominating the mobile space. That creates an incredible vacuum for a startup. In February I wrote a post called “Will There Be A (Successful) iPhone-Only Social Network?” and presented an argument that the iPhone SDK presented a compelling opportunity to launch a mobile social network while avoiding the chicken and egg problem that any new network, and particularly a mobile network, would encounter. iPhone penetration in Silicon Valley, and among early adopters, is so high that the application could spread virally among those communities. As the network gains traction, it could expand to Google’s Android platform and grow from there. iPhone users are the perfect group to launch the network to. They’re passionate and elitist, and will like the idea of being in an iPhone-only club. Go to a party and see a picture and first name of everyone there who’s holding an iPhone – then meet them and add them as friends. Then, once mutual friendship is established, see those people wherever they are in the world, along with presence information telling you what they’re thinking, or up to. I believe in the idea so much that I explored putting together a team to build a basic network on top of the iPhone SDK. But I abandoned that idea last week when I saw a live demo, on the iPhone, of an upcoming social network that does everything I called for in that February post. The startup behind the new application won’t let me disclose their name yet. But the application is awesome. It shows you everyone around you who has it installed on an iPhone (default privacy is set to off, but can be changed). 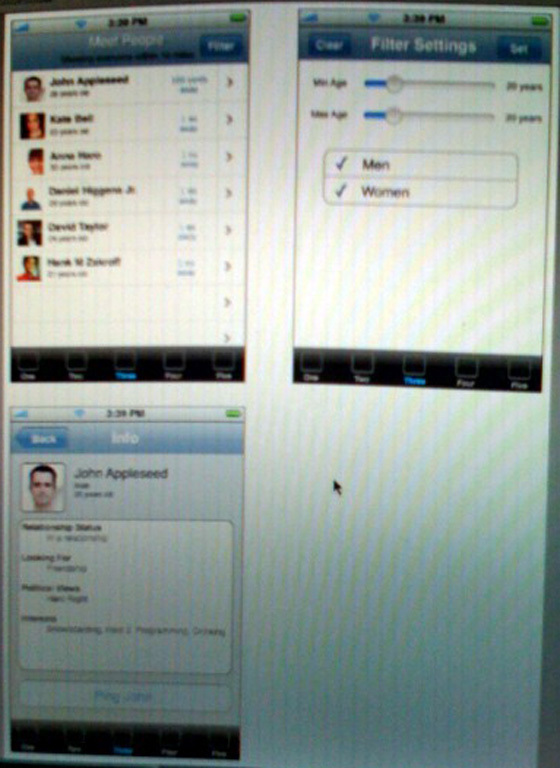 Users can scroll through nearby users, and set filters for men, women or age ranges. If you find someone interesting you can pull up their profile and ping them. If they respond you can start a chat, on the phone or in person. Of course, they can also choose to block you. Location is based on the triangulation feature of the iPhone, which is accurate enough to get this going. And the startup thinks they’ve found a way around the fact that third party iPhone applications can’t run in the background (meaning you’d have to have the application open, and not use any other iPhone features, to run the social network and see others). They explained the work around in general terms to me, but asked that it remain confidential for now. As I said, I saw the app running on an iPhone and even the early prototype left me speechless. It will, I believe, prove to be very popular, and very valuable. The image shows a mockup of the functionality I saw working live on the phone (I should be able to show a photo or video of it running in the next week or two as well). Look for a launch when the iPhone app store opens this summer. Credit for that awesome image at top of post is to Hank Grebe at MediaSpin.